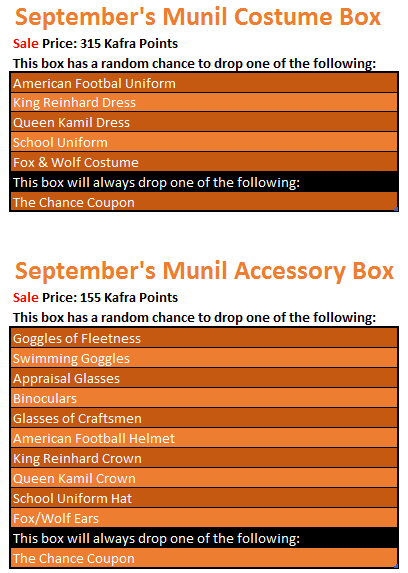 September Munil Costume and Accessory Boxes are on Sale! Get your September Munil styles before they're gone! In celebration of the updated Phantom Pyramid items, Phantom Stones are on sale! A variety of Halloween Boxes have been added to the Kafra Shop! Get your favorite spooky mount, costume, accessory, or even a new title! Collect even more Halloween Pumpkins with the Halloween Pumpkin Box! 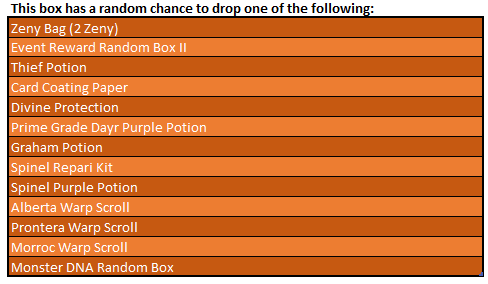 This box contains a random amount of Fresh, Glittering, or Blessed Pumpkins. 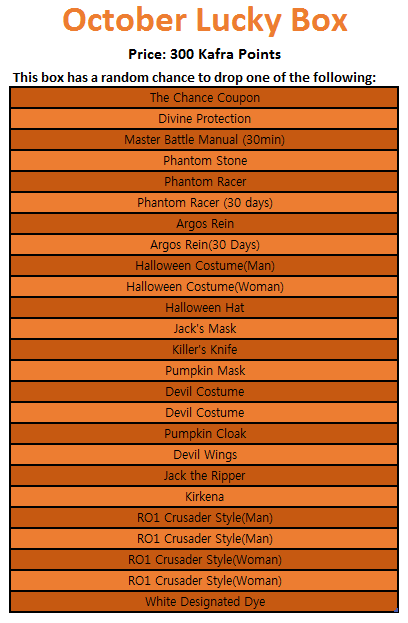 Use your Hallowed Pumpkins for HP buffs or to trade in for Broken Jack Oranton's Pumpkin Sword for the Halloween Magician title! See the events section for more details! The Phantom Racer has Arrived! Need your spectral mount right now? You can find a 30 Day version of the Phantom Racer in the Kafra Shop this month! 'Tis the season to be spooky. 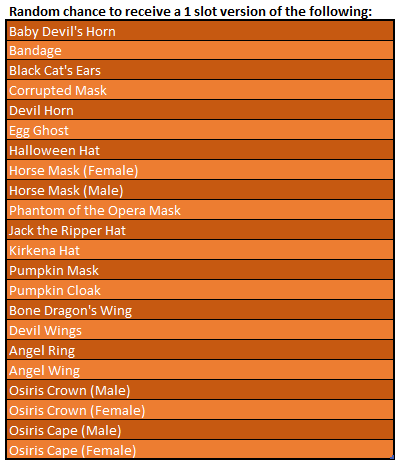 Find your new Halloween costume or mount in October's box! The top position of the Phantom Pyramid has received a fang-tastic makeover.The Dracula Legacy back accessory has arrived! Please note: The orange glow effect is from the costume, not the cape! The Trick or Treat event has returned! Begin your adventure by speaking to Lili. Visit the Kafra NPCs in Morroc, Alberta, and Prontera to continue collecting pumpkins! 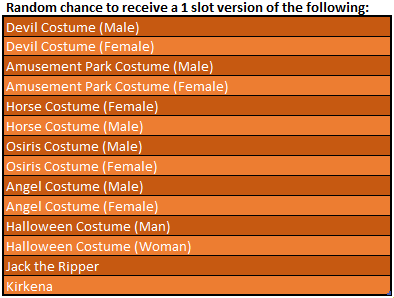 You can exchange lower tier pumpkins for their higher versions, and trade in pumpkins to NPC Jack, located next to Lili, to collect two new Khara title items. Pumpkins can also be acquired through the Kafra Shop. The spirits of the dead have awoken in Rune-Midgarts. Only the bravest heroes in the kingdom should attempt these new missions. Those heroes completing the quests and Draugr Slayer Khara Mission will be rewarded with the Draugr Slayer title (+28 STR,+27 INT, +28 AGI, +12 WILL, +42 VIT). Begin your quest with Astrior Collins in Prontera. Visit the Halloween Event Page for more information! It's time to get happy! Happy Hours have returned! Happy Hour Boxes Drop Four Times a Day! Be sure to farm monsters within a five level range! Quests are popping up and buried treasure litter the shores of Midgard. Visit One-Eyed Ed and collect your booty. Visit the Pirate Event Page for more details! - world map - Yigdrassil Garden to Yggdrassil Garden. - Himelmez's Chamber -> Himmelmez's Chamber. Glad to see a change in the pyramid, it was about time! This is great news! Finally Bowling Bash gives in rage the equivalent of 2 auras! EDIT: I wonder if any changes were made. BB feels exactly the same as before. Edited by 5318130516144610857, 04 October 2016 - 10:12 AM. Its Phantom Pyramid Time ! Are we getting any Reward for last week Killing skeletons Event? BECAUSE THERE WAS NOTHING IN MY TEMP BOX THAT LOOKS REMOTELY LIKE THAT!!! What gives? Updated events section to provide a bit more information about both Halloween events. More details about both events can be found on the Halloween Event Page! Killing Skeletons event is The Red Flag Be Raised and the prizes for that is EXP Bonus. And the mob, Flying robberbug -.-" ? i cant enter in the game, somebody helpe me? Last time there was bugs related to dungeons, it was caused by the dungeon servers being put under a lot of strain. It's likely that the amount of people crashing through dungeons for diamonds as fast as they can is taking a bit of a toll. Draugh slayer will have daily quest like last year or 1 time quest only? There will be three daily quests from the NPCs involved in that questline after you obtain the Draugr Slayer title. The rewards will be either Seals or an Adventurer's Battle Manual depending on the NPC. so Halloween daily still get red seal? So how to earn Pumpinks beside Lily Quest, Kafra Quest and buy from Kafra shop ??? why is there no more experience event this week? i thought there will still be experience vent because of last week's skeleton kills. please answer me. thank you! !